Project Spartan – the code name of the new browser that Microsoft is working on for Windows 10 slated for a July 29 release – is now officially called Edge. If you have joined the Windows Insider program, you can get a preview of what the browser will look like. It shares many features with the latest versions of Internet Explorer that users will find familiar, but at the same time there are many new additions and ways of doing things. 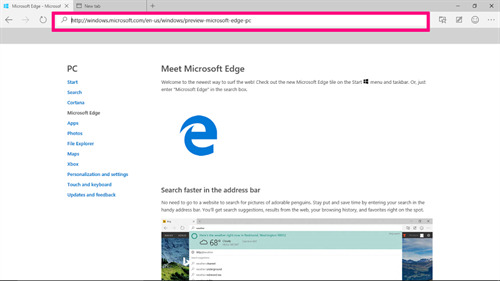 Among the many interesting features that Microsoft Edge brings is the change in the way the Search Bar and Address Bar work on the new New Tab page. 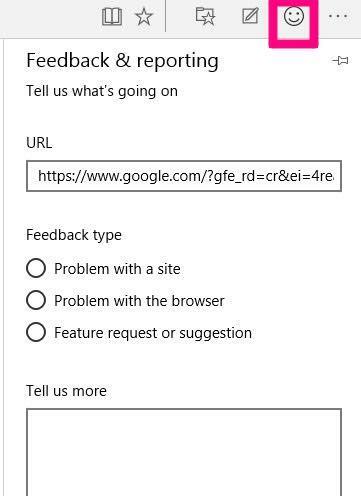 Edge does not have an address bar visible by default. Instead there is a prominent search bar where you can type in search terms as well as web addresses. This box has the same functionality as the old Bing search box on Internet Explorer, but its placement on the screen is more central. The Search Bar, as of on the latest build 15.10130.0.0 of Edge on the Windows Insider Preview, has moved away from its awkward position just below the address bar at the top of the screen, as it was on Internet Explorer. It comes down to the center of the upper third of the screen in a much more navigable format instead of being pinched into a row at the top close to the address bar. There is also a text guide - "Where to next?" unequivocally guiding newbies - grandparents, not-so-savvy users and others - to their destination. Note that Microsoft doesn't seem to allow the user to hide this search bar permanently at the moment. The old address bar at the top of the page is usually invisible. It can be made temporarily visible in two ways - either when you navigate to a website via the search bar or when you click on the grey area. The address box then shows up in the area in line with the Refresh button. Only if you click in this area does the bar appear, and you can enter search terms or addresses. Clicking on the Address Bar also seems to make the Search Bar disappear momentarily from the New Tab page. 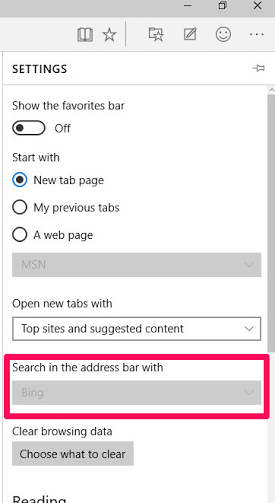 If you navigate to the Settings menu from the top right corner of the screen, you will see that the default search engine for the address bar is set to Bing. Many of us may want to change that to another search engine, and doing so should be simply a matter of clicking on the box and changing "Bing" to the search engine of our choice. At the moment, however, Bing is the default search engine that Project Spartan users on the Windows 10 Insider program cannot change. The only way to do so would be to use a registry edit that can change the default search engine to Google Search. It is expected that when Microsoft Edge is finally released, you will be able to change the default search engine from the Settings menu. You can of course send feedback regarding this as well by clicking on the smiley icon next to the More Actions option. This Windows 10 is bad, I want my old version back. You can't hide the task or tool bar in edge it takes up too much viewing room on my laptop.